SIGN US UP: Minister Tufton having a moment with colleagues Natalie Neita-Headley and Kamina Johnson-Smith at Friday's launch. According to the experts, 30 minutes of exercise every day can greatly lower your risk of contracting a non-communicable disease. Here’s an even more astonishing fact: seven out of 10 Jamaicans die from a non-communicable disease. 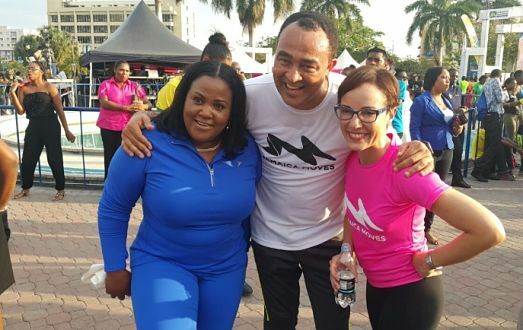 Against this backdrop, Minister Christopher Tufton and his team at the Ministry of Health have launched Jamaica Moves, a wellness/fitness initiative that’s about to go islandwide, promoting the supreme value of exercise and all-around healthy living. “We want Jamaica to know that it can be fun to exercise. It’s a chore; it’s a duty to yourself. Any type of physical activity is a benefit to yourself. 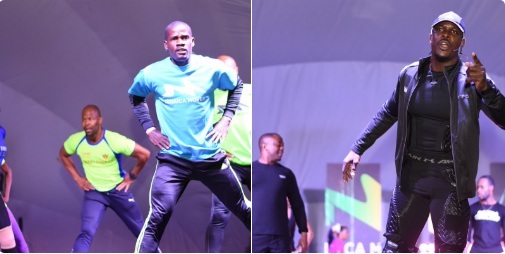 It’s a serious message we are spreading for Jamaicans to lead happier, healthier and longer lives,” said Minister Tufton, clad in his own exercise gear as he addressed the scores of workout-ready Jamaicans who flocked to the high-energy launch at the Emancipation Park on Friday evening, an event which doubled as an observance of World Health Day. At Friday’s launch, patrons enjoyed a mix of high-intensity workout sessions with some of the island’s top fitness gurus (including Sweet Energy Fitness and Randy Myers, above), rope-climbing and new products sampling and checked out the informative booth displays from the National Family Planning Board and the Heart Foundation of Jamaica, among other entities. 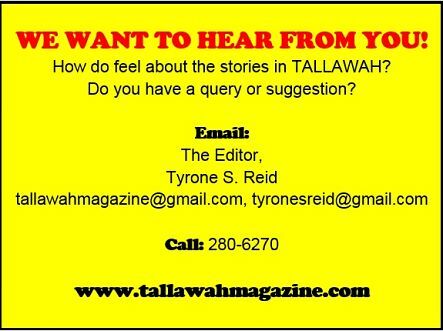 To learn more about this islandwide initiative, and to find out when the road show is coming to a town near you, email jamaicamovesja@gmail.com or call 631-8345.